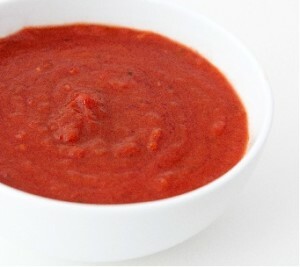 Marinara Sauce: Marinara sauce is a southern Italian tomato sauce usually made with tomatoes, garlic, herbs, and onions. Its many variations can include the addition of capers, olives and spices.It is occasionally sweetened with a dash of red wine.Traditional southern Italian cuisine uses this sauce to add flavor to pasta, rice, seafood and pizza. Heat olive oil in a large pot over medium-low heat. Add onions and garlic to the hot oil. Cook until the onions are translucent, stirring occasionally. Add the grated carrots and a pinch of salt. Cook another 3 to 5 minutes, stirring occasionally until softened. While the vegetables cook, open tomato cans. Pour tomatoes with juices into a large bowl. Use your hands or a potato masher to crush the tomatoes until desired sauce consistency. Add crushed tomatoes with all juices and bay leaf to the pan. Stir the sauce then bring to a boil. Reduce heat to a gentle simmer. Cook for 20 to 30 minutes, stirring occasionally. Adjust the seasoning with salt and ground black pepper. Remove bay leaf and discard then stir in chopped basil. Cool and refrigerate up to one week or freeze up to 6 months. If the sauce is too bright or acidic, try adding a pinch of sugar to balance the acidity from the tomatoes.